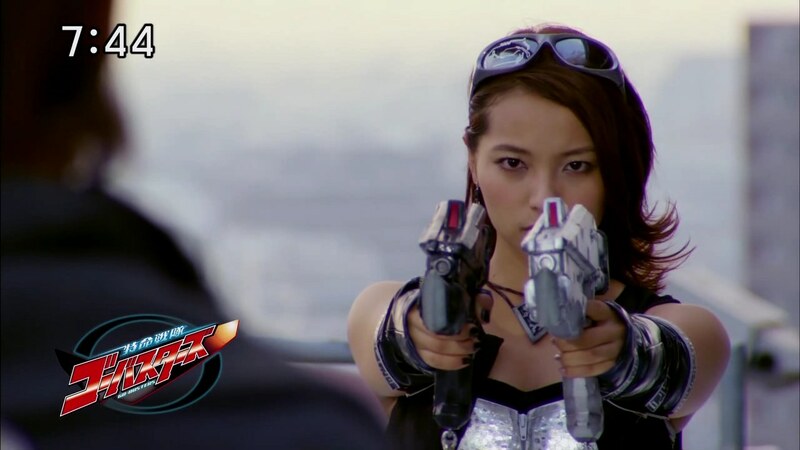 Recap: Tokumei Sentai Go-Busters, Mission 28 – Beware of Chickens! Enter is in the subdimension. With Messiah nowhere to be found, he uses his laptop to ask the Creators how he is. They tell him Messiah is in pain. 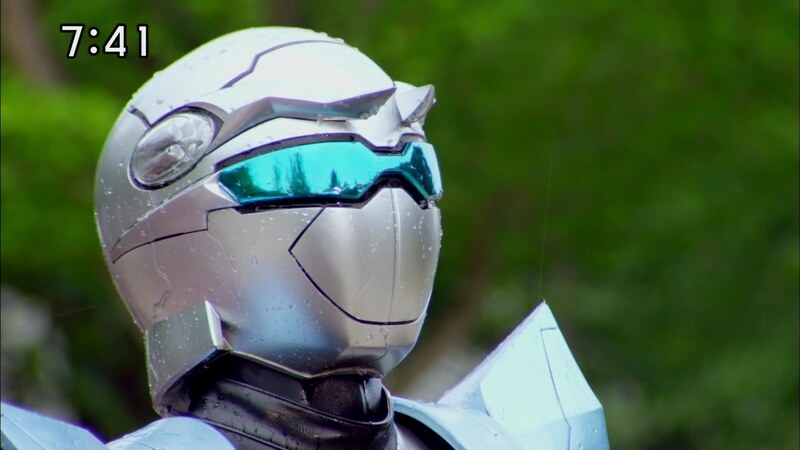 At headquarters, Hiromu is all dressed up as he and Nick are about to head off to an awards ceremony honoring his sister’s new book. Hiromu half-freezes when Nakamura reads the book’s title, “Chicken Rock and…” Nick follows Hiromu as he shuffles he way out the door. On the highway, Nick expresses his concern that Hiromu will be freezing all over the place since the venue will be filled with pictures from Rika’s children’s book featuring chickens. 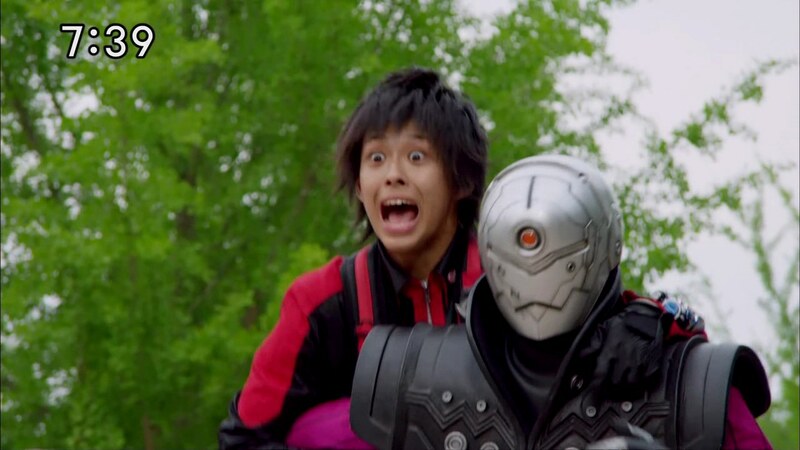 It’ll be okay, Hiromu says, especially since it’s been a while since Nick has seen Rika. Not like Nick cares or anything… or so he tries to pass off. Meanwhile, Escape confronts Enter about not being able to contact Papa. He tells her what he’s doing is helping Messiah and proceeds to created a Sprayroid. 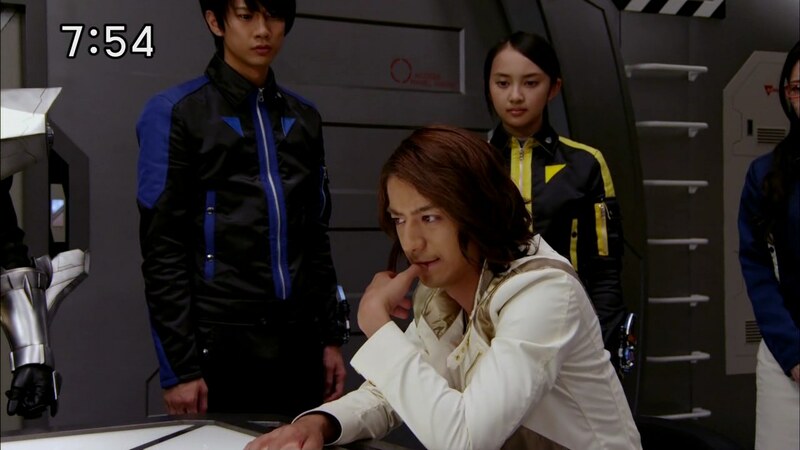 He tells it to find out what Hiromu’s weak point is while keeping the Go-Busters busy. Just as they are about to arrive at the venue, Morishita calls Hiromu about the Metaroid and they drive off. Rika sees them and follows. Nick and Hiromu meet Enter and the Sprayroid. 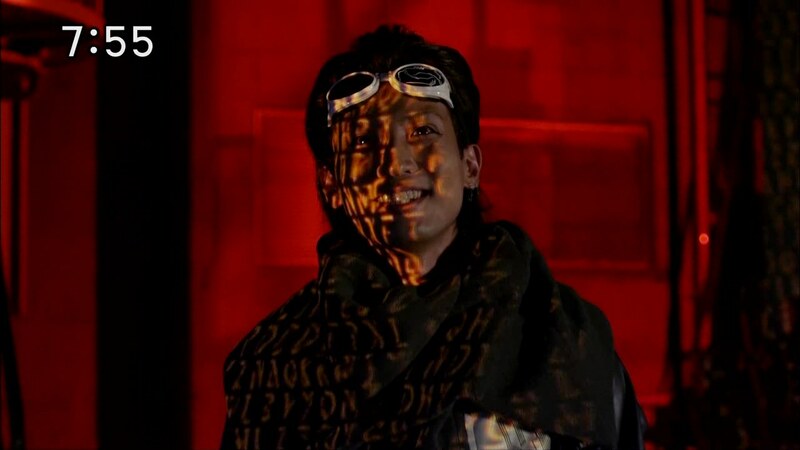 Enter takes his leave and the Sprayroid sprays Nick, turning him into an exact copy or Hiromu. 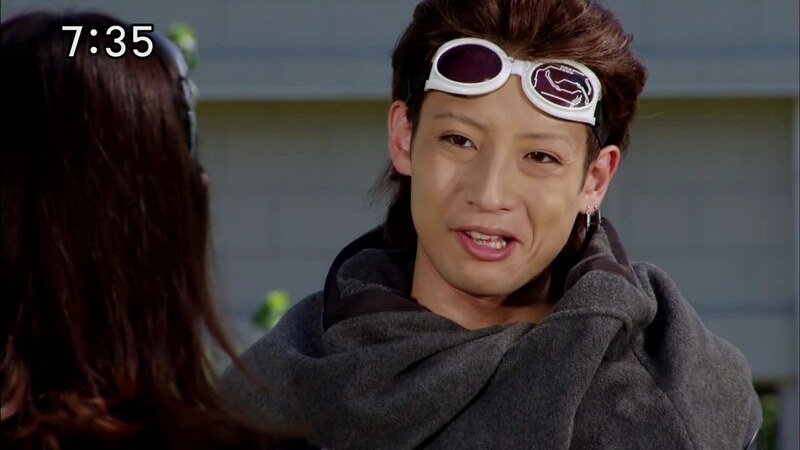 Ryuji and Yoko arrive, they all henshin to fight off the Buglars. 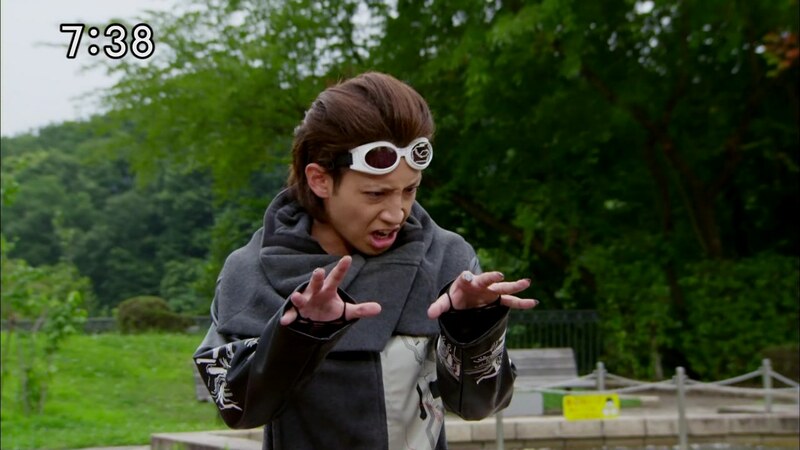 But the Sprayroid sprays them, turning Hiromu into an unmorphed Yoko, Yoko into an unmorphed Hiromu and Ryuji into… Enter! The Sprayroid paints some buglars in pairs of morphed Go-Busters. Yoko mistakes Ryuji for Enter and gives him a swift kick. Rika pops in as Nick is hiding behind a tree. He takes her away. 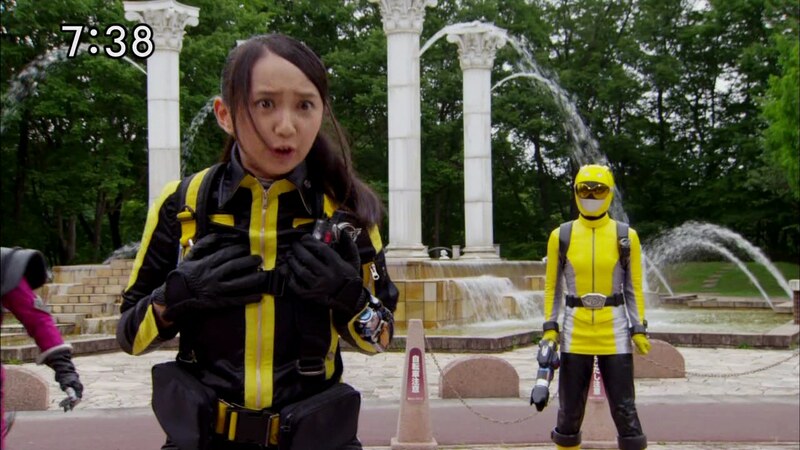 J comes running to help, but starts fighting everyone including hurling a Yoko’d Hiromu into the fountain. But that was his plan. 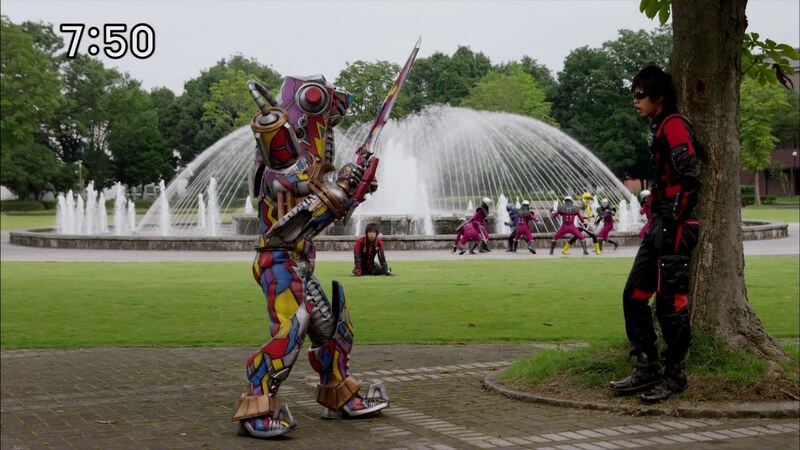 Hiromu returns to normal after the fountain’s water washes off the Sprayroid’s paint. 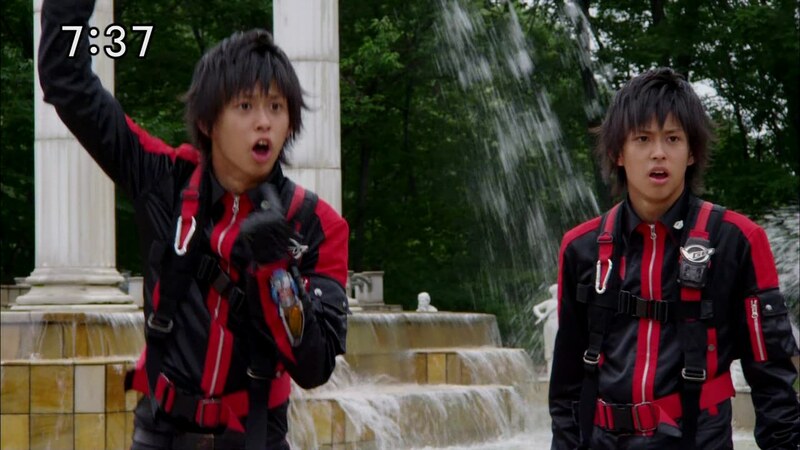 Yoko and Ryuji jump into the fountain and they kick some water at the Buglars and everyone’s back to normal. Nick, with Rika, is lost of course. He turns his back to her for a second and the Sprayroid shows up to knock Rika unconscious. It then sprays itself to turn into Rika. The Sprayroid tries to get Hiromu’s weakpoint out of Nick… and it does. It kicks Nick to the side before changing back. Nick quickly thinks to pretend that he knew all along it wasn’t Rika and tries to make Hiromu’s chicken weakness seem too stupid to be true. Jin arrives to help Nick and the Sprayroid runs off. Enter is talking to the Creators again and tells them not to waste this chance. Escape pops in and wants Gog and Magog to have some fun as well as she points her guns at Enter. He tells her she shouldn’t do that if she wants to help her Papa Messiah. Hiromu sits by his sister at the hospital. Nick feels awful for having spilled Hiromu’s weak point to the Sprayroid. Yoko wonders why chickens and Nick explains. 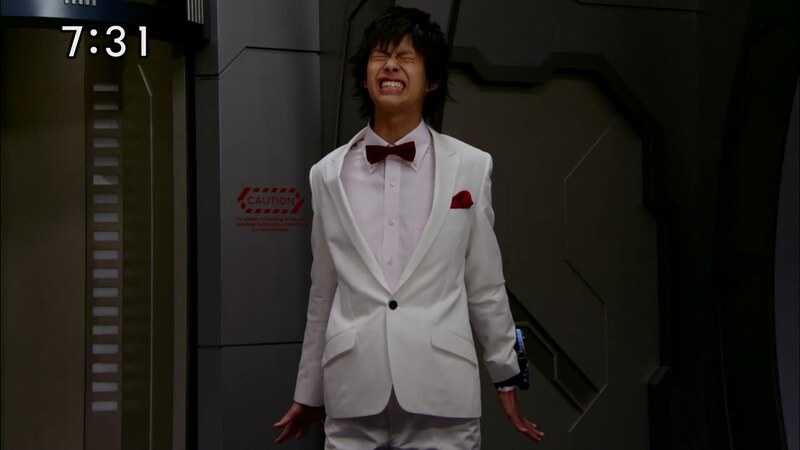 When Hiromu was a kid, he got trapped in a chicken coop while playing hide and seek. 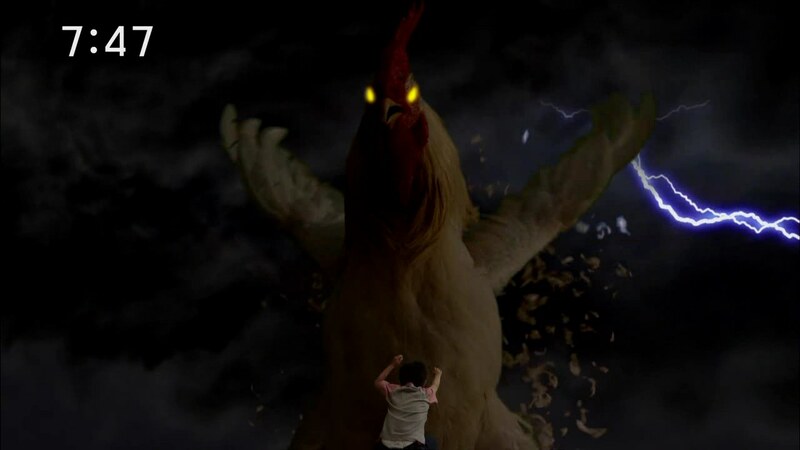 It was dark, scary and worst of all, he had to pee just as one of the chickens attacked him. Hiromu comes out into the waiting room and tells Nick to wash off the spray-on Hiromu. 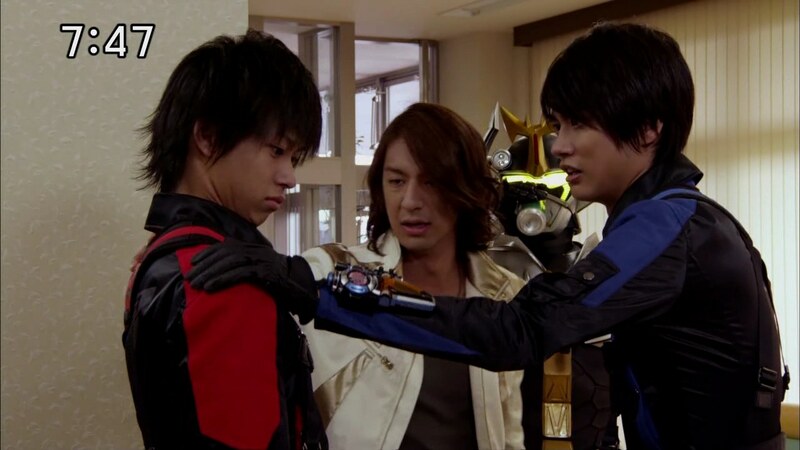 Jin and Ryuji give Hiromu pats on the shoulder. Morishita and Nakamura call them about the Sprayroid and an incoming Megazord. Before they leave, Nick has a plan to trick the Sprayroid about Hiromu’s weakpoint. The other four Go-Busters henshin and fight off Buglars as HiromuNick goes after the Sprayroid who holds up a chicken picture. The Sprayroid quickly realizes Nick is the imposter and sees the real Hiromu hiding behind a nearby tree. Jin and J break off to fight the Megazord. 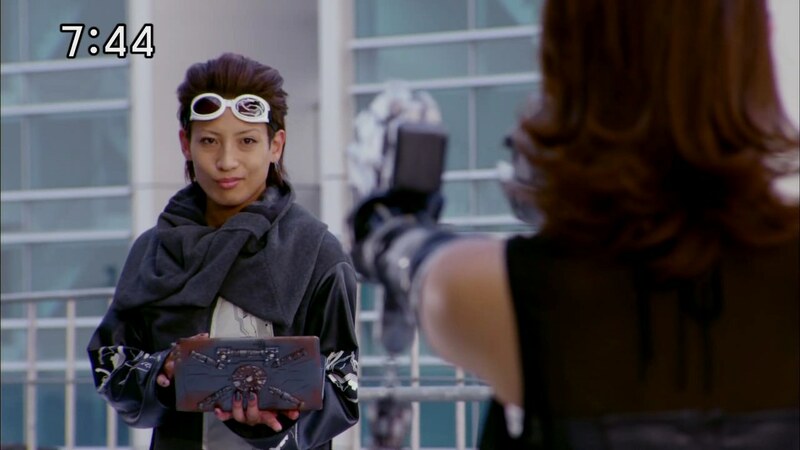 The Sprayroid shows Hiromu the picture, but he closes his eyes and pretends to be affected by it. Nick calls out to Hiromu to signal an all clear when the Sprayroid puts the picture down and he attacks. 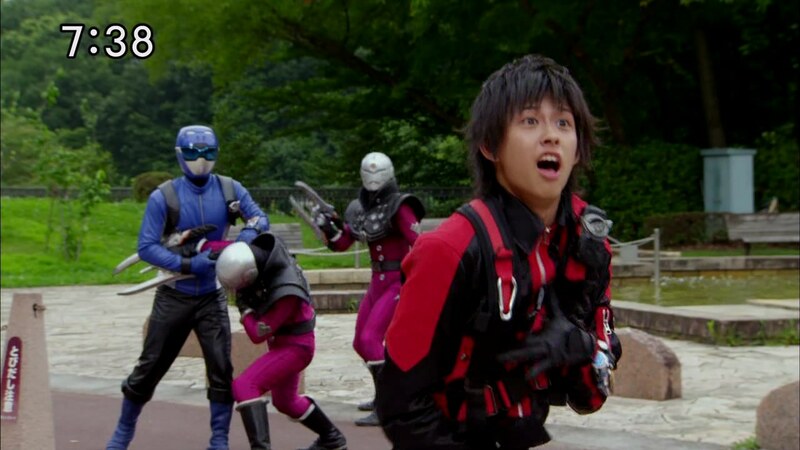 Ryuji and Yoko join him to finish the Metaroid off while Jin and J do the same to the Megazord. Later, Rika tells Hiromu thanks for coming to the ceremony, but maybe it’d be better if he didn’t go inside what with all the chickens plastered about. 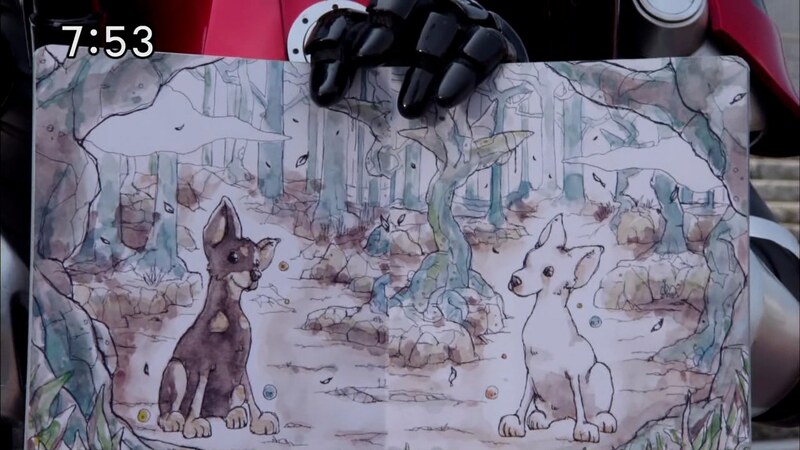 Nick is reading Rika’s book and wants to show Hiromu a cute picture of two dogs. Rika explains the dogs are Gog and Magog, named after their mother’s prized dog statues at home. 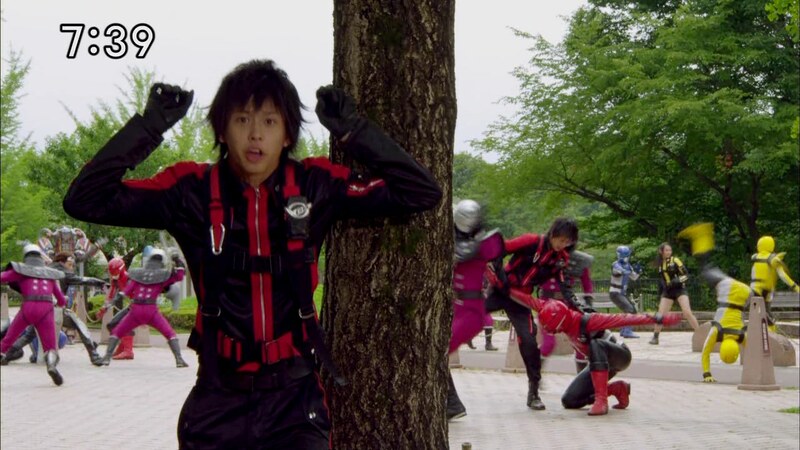 Hiromu and Nick remember Escape’s guns. At the Command Center, Jin tells them that the Enetron he’s been using and keeping in the subdimension is all gone, taken for Messiah. The Sprayroid was just a diversion. He tells them Messiah is acting weird and that it seems something is starting. Kuroki demands Jin tell them everything that’s happening in the subdimension. Speaking of, Enter is watching as Messiah continues to wreak havoc in the subdimension, until something begins forming. “Now… evolve,” Enter says. 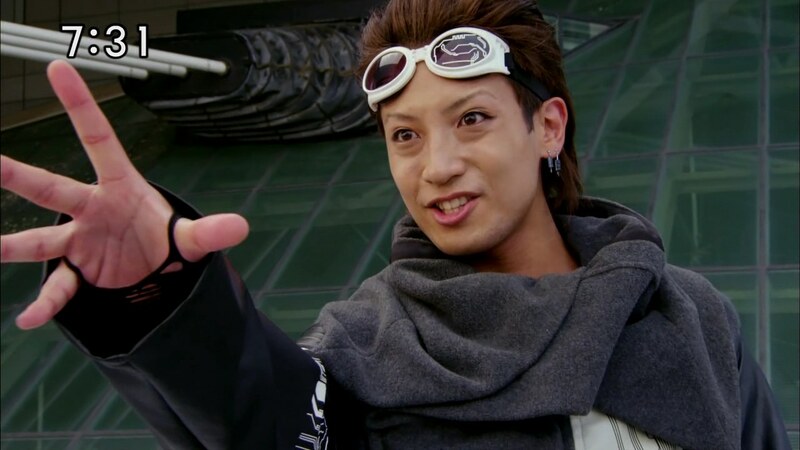 So, the new opening is suppose to signal Go-buster’s retool or “shakeup” (as Nobuo Akagi of explained in Akibarangers, hee). 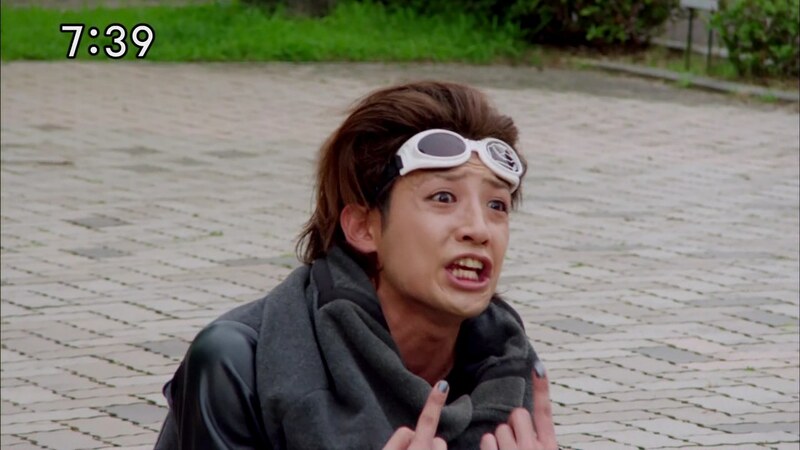 It’s no secret the show has unfortunately been bleeding viewers and is on track to be the lowest rated Sentai season ever. So, there have been rumors and talk about some changes coming to the season to hopefully perk the numbers up a bit. First, the new opening theme song feels odd. Definitely not a theme song kind of a song. Seems like it was a battle song they decided to try out as the opening. The original Go-Busters theme was great, especially with the freshened up remix from the summer movie. While the new opening looks a lot more energetic and exciting, the original was just fine. And I don’t think people, kids, will or won’t watch a show because of its opening title sequence. Then again, I don’t know the Japanese audience. 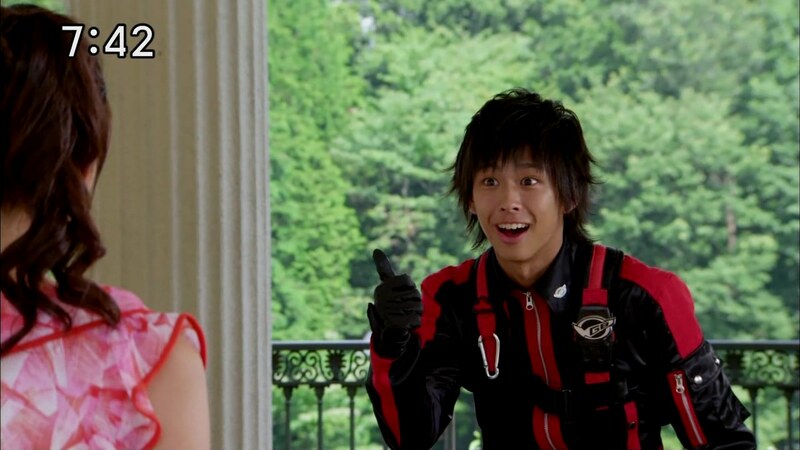 Now, the good and the bad (though mostly good) of Go-Busters so far deserves its own post, so I’ll do that later. But really, this episode was like much of the first 27 before it, except for the big story developments at the end. I enjoyed it a lot thanks to the hilarious scene where they get spraypainted with each other’s bodies. 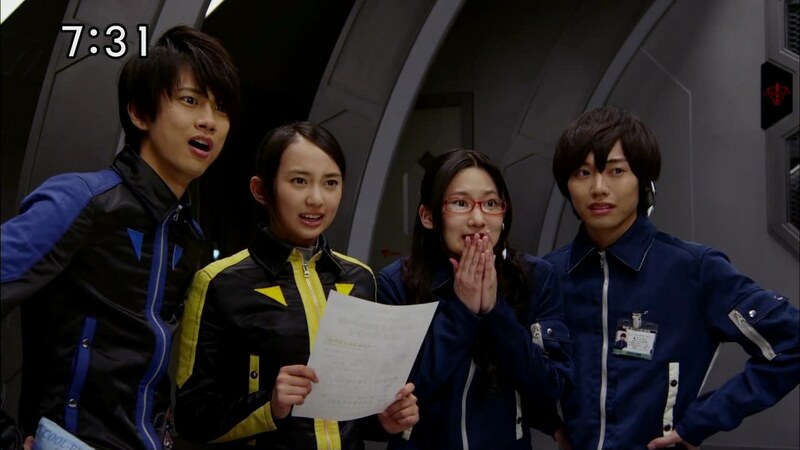 I thought the actors did an excellent job matching the mannerisms of their respective new characters; Katsuhiro Suzuki as Yoko (and Nick), Arisa Komiya as Hiromu and Syo Jinnai as Ryuji. It was a fun and hilarious scene, but we’ve had plenty of lighthearted moments in the previous episodes. But really, the cliffhangers showed that they may indeed be wrapping things up and heading in a different direction. Then again it could’ve just as easily been the plan all along and we’re just headed into the 2nd half of the season. Anyway, no matter what they try to do, I hope it’ll both bring more eyes to the show and maintain the solid, balanced show we’ve already had so far.